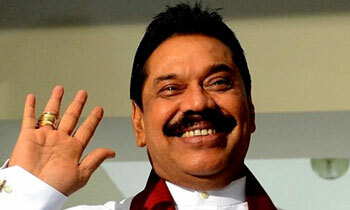 Former President Mahinda Rajapaksa who led the new political party, the Sri Lanka Podujana Peramuna (SLPP) to the Local Government election victory, today said it was clear that Sri Lanka needs a change. “Thank you to all who supported the vision of the Sri Lanka Podujana Peramuna at the LG election. Your voices have been heard. It’s clear that our country needs a change,” he said in a tweet. In a statement this morning, Mr. Rajapaksa said the opposition has been able to achieve this victory amidst unprecedented persecution and harassment. “Despite the personal harassment they may have had to face over the past three years, I earnestly request all those who contested under the SLPP to celebrate this hard won victory peacefully and with restraint and in a manner that will not inconvenience the defeated side,” he said. He said the members of the SLPP should be mindful to celebrate the election victory in a peaceful way to show their appreciation to the voting public of Sri Lanka. What a come back sir. Salute! Yahapalakas should know they can't fool the people all the time. All the best sir. Let's look forward to a new era again. To the earlier system, white van, corruption et all,No? Yes, people want change with corruption less politicians. They told you in 2015 they don't trust you with big money. Now they have given you the responsibility with small councils (less money) , make use of it and show you can be trusted. In 2020 people will decide! For last 3 years, UNP together with SLFP had clearly proved that MR and his mates have not done anything wrong to this country. On that grounds, people took this opportunity to apologize MR by casting their votes for SLPP. Is that what happened? You must be a southerner. We wish the Blessings of the Triple Gem upon you Sir. Country needs a change. Sure. But this is not the change many expected. After few moths, may be in a few weeks your crooks will start their real work. 55 percent of the population did not vote for you. Masses have not forgotten your dark era; however they voted against incompetent, corruption protecting RW and My3. If they later can reverse and keep up their promise, in two years you and your lot will be swept under the carpet. Please don’t Try to bring % and ignore the point. The point is people desire MR as their leader loud and clear. @Rohan. Of course, people who voted MR don't understand percentages.. Yes, but not you and your family. We voted for SLPP to teach a lesson to the President. Don’t ever think that we will vote you back into power. This is local govt elections and it is a protest vote, pls don’t get excited. You and your lot should be behind bars. Certainly. The Government has to step up investigations against all you people! So, why don't you assist this essential change !!!? Mahinda 2.0! Country is ready. Yes, enjoy peacefully since the Yahapalana Govt., made it possible to hold free and fair elections. Change will come only when you do well in the electorates. Winning is not everything , its just a beginning , so don't jump the gun!! Yes the country needs a change!But not with you as PM!Dream on! Exactly correct.country need a change with honest and able leader/leaders.enough killers theives and fools destroyed the country during last 70 years. Yes the country needs a change in leadership, but not a gorilla like you! It is very clear that the country needs a change. But, unfortunately not the one you imagine. Yes, country need to change the march of collective thieves, This bunch cannot do that. Hopefully the central government will check every single rupee which will be given to the local bodies run by your people. You are talking as if you have been elected as the new President. You are still just an MP. Be assured that the wheels of justice will not stop but will continue to grind for you. Yeah but you're not it! Your Excellency, Mahinda Rajapakse,People or Masses of Si Lanka trusted up on the responsibility to you once again mainly as a matter of gratitude to you as the 06th Head of the State among long list of Kings and Presidents to brought the Motherland together IN A HISTORY running for more than 2500 years.The leadership that you have given was exemplary in the process of annihilation of Terrorist LTTE and its leader Prabhakaran as you never ever bowed down to so called Western Powers.In view of the re-emergence of you as a great leader and a true son of Sri Lanka, we would like to invite your serious attention to the following:1) No to constitutional reforms to give the Elam on a platter as Yahapalana tries. specifically Ranil.2) Must maintain Sri Lanka as a Sinhalese Buddhist nation.3) Continue your drive for the development of the country specifically Agriculture including attaining the self sufficiency of Rice rather than looking at the sea for food ships. Continuation.....4) No Corruption and accountability must be maintained.5) Must take action to Ranil, Ravi, Mahendran, Aloysius, Palisena, Cope committee members involved in foot notes in the investigation of Bod Scam, whom involved in day light Robbery or Plunder of Central Bank of Sri Lanka.6) No Human right cases or Prosecution by foreign or local judiciary for any act by victorious Armed forces of Sri Lanka during annihilation of Terrorist LTTE and its leader Prabhakaran.7) Taking care of subsidies rovided to farmers, other governmental officials and Sri Lankan masses as a whole for their Economic development and day to day living.8) Approach to so called Tamil problem as mere Economic problem as same as to all the people of Sri Lanka.Finally, we wish you all the best for the re-emergence and look forward to a great country through your great leadership. You are asking this guy to reduce corruption? Really? YesSir, the country needs a change but not the change that has taken part now. we need a change. We needed non corrupted untarnished leadership.This is almost like exchanging ginger with chillies. This guy still sells the war victory for his own gain. He wasn't the one who made strategies or neither fought in the war, but yet he still greedily takes the full credit for the war victory. And trying to plunder the country again. Bravo MR and Team ! !What a come back.... Now that looking forward to big match. Part 1 - Mahinda Rajapakse,Masses or people of Sri Lanka has voted to you mainly as a Mark of Gratitude to your leadership in annihilating terrorist LTTE and its leader Prabhakaran and it is only the 06th occassion a Head of the State of Sri Lanka among long line of kings and residents did so in the history of more than 2500 years as you never ever bowed down to so called western powers,In view of the above, we would like to bring to your serious attention to the following:1) No to Constitutional reforms to give Tamil Elam on a platter where terrorists failed after 30 years of violence.2) Must maintain the Unitary nature of Sri Lanka and its territorial integrity.3) Maintain the very fabrication of Sri Lanka as Sinhalese Buddhist country.